The Prosecutors will argue Michael Jackson was vibrant, optimistic and physically capable of handling O2 Tour. The defense will argue that he was in frail health and was stressed out about performing in 50 shows, thus, took his own life by chugging Propofol. %99 of the drug would have been eliminated by the liver before it is released to blood. Blood levels on the autopsy report is NOT indicative of oral digestion. 2- How do you claim that Mr. Jackson’s health was in bad condition without impeaching your client who repeatedly claimed that Michael Jackson was healthy? By impeaching Murray, the defense will paint their client as a liar. And if Conrad Murray lied about Michael Jackson’s health, how can his veracity on other issues be trusted? 3- If Michael Jackson was a frail man with declining health, what does it say about the medical judgment, more accurately, lack thereof, Conrad Murray exhibited by subjecting his fragile patient to an untested treatment of insomnia under dangerous circumstances? 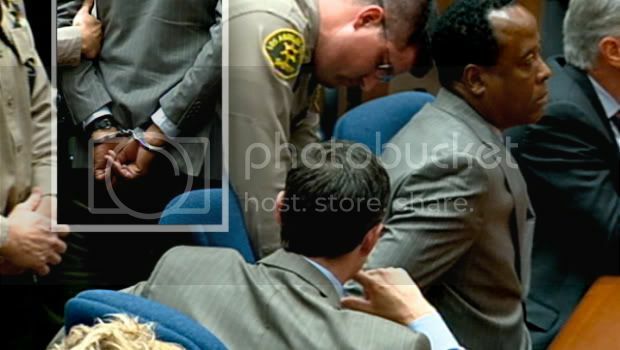 Conrad Murray’s culpability. How do you, on one hand, say that the patient was frail, on another, you ADMIT to treating him under circumstances that 'shock the conscious'? to practice medicine with the utmost respect for his patient's welbeing. Instead he demonstrated extremely poor medical judgement and ultimately took the life of his patient. His conduct is unprofessional and reckless. This is conduct from which the public should be protected. Murray's criminal conduct and reckless actions taken in the care and treatment of his patient, Michael Jackson, makes him a danger to public"
4- When I look at the video of Michael's Press Conference at O2 arena, I see a man who is elated by the love and adulation by his fans. A man who is exuberant, happy, healthy and pumped up. Yes, the number of shows was increased from 10 shows to 50 shows. No, Mr. Jackson wasn’t happy about it. The shows were increased on March 12, 2009. Why would he wait 3 months to suicide? Why even invite Murray to come over if he was going to chug Propofol? Murray himself said that he was asked to help Mr. Jackson sleep. it is not a homicide, is it? Kudos for the defense to conjure up inventive ways to defend the untenable actions of their client but why rely on a video to gauge Mr. Jackson’s health? 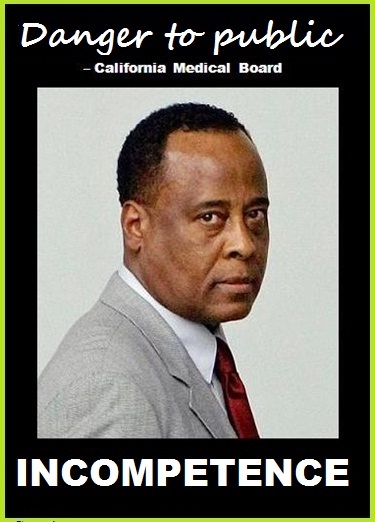 After all, Michael Jackson’s health was Conrad Murray's purview. He would be the go-to guy to inquire about Michael Jackson's health. On June 19, 2009, Kenny Ortega sent Mr Jackson home from rehearsals because he didn’t seem fine. Prosecutor: Had you seen Michael in that kind of condition previously? On June 20, 2009 a meeting was called at Mr. Jackson’s home. Randy Phillips, Paul Gongaware, Kenny Ortega, Conrad Murray, Frank Dileo and Michael Jackson attended. Q. What was Dr. Murray’s demeanor as he is saying these things to you? Q. Did he elaborate? Did Dr. Murray elaborate at all in regard to what your role was in relation to Dr. Murray’s role as it pertained Michael Jackson? Following the June 20 meeting, the crew had a three-day-break due to Father’s day. Rehearsals resumed on Tuesday June 23. By all witness accounts, Michael was energetic, happy and his brilliant self during June 23 and June 24 rehearsals. Q. What was Michael’s general demeanor on June 24? Q. Did you ask him [Conrad Murray] what the underlying medical condition was? A. I did. He didn’t answer. I repeated the question and he said ‘there isn’t any. On June 25, 2009 at 5:54AM Bob Taylor of Robertson Taylor Insurance (broker for Lloyd’s of London) sent an email to Conrad Murray inquiring about Michael's health. "I asked 'what happened'. Dr Murray reported the patient had been in his usual state of health, not ill, but he had been working very hard and he though he may be dehydrated"
Q. So he said he had not been ill, is that right? Q. Can you explain your conclusions in regard to his general health?